The United States investigation into the 9/11 attacks has once again come under the geopolitical microscope after former Al Qaeda operative Zacarias Moussaoui’s damning testimony. The so-called ‘20th hijacker’, in his recent testimony in a lawsuit alleging Saudi involvement in the attacks, has accused members of the Saudi royal family of funding Al Qaeda to carry out the catastrophic New York and Washington attacks. Among the most influential Saudi royal family members accused by Moussaoui of funding the terror attacks are Prince Turki al-Faisal, then the Saudi intelligence chief, Prince Bandar bin Sultan, who served as Saudi ambassador to the US, and Prince al-Waleed bin Talal, a billionaire investor. The three princes have deep ties with the US and Prince Bandar is even known as ‘Bandar Bush’ for being close to Bush family and the ‘toast of Washington’. This is not the first time the Saudi royal family has been under the spotlight for all the wrong reasons. Not only the families of the 9/11 victims, but the US lawmakers have also accused Saudi royal family of having tacit alliance with Al Qaeda and being involved in attacks. Adam Schiff, the top Democrat on the House Intelligence Committee, wants the 28 pages of Congressional Joint Inquiry into the 9/11 attacks declassified only to ‘demystify’ the notion of a Saudi conspiracy. Prince Bandar is believed to be one of the beneficiaries of £40 billion Al-Yamamah deal with largest British military conglomerate, BAE Systems. The deal was made by the Margaret Thatcher’s government with Saudi Arabia in 1985. According to Executive Intelligence Review (EIR), Prince Bandar is believed to have received millions of dollars into his Riggs Bank account in Washington in corrupt commissions from ostensibly oil-for-arms barter deal. However, EIR alleges, hundreds of billions of dollars were squirreled away in offshore bank accounts. These slush funds, according to EIR, have been bankrolling terrorism since then. Some of the money was funnelled to at least two of the 9/11 hijackers – Khalid Al-Mihdhar and Nawaf Al-Hazmi – from Prince Bandar’s account. BBC investigations also revealed that £120 million was sent by BAE Systems to two accounts of Saudi embassy in Washington. But Prince Bandar, who has denied being involved in corruption, was withdrawing the money for his personal use which was actually meant for the Saudi government. The British prime minister ordered the closure of the investigation soon after Swiss authorities agreed to provide confidential information about one of the key Swiss-based slush funds, through which the money was believed to have been channeled to fund terror operations. The newly-crowned Saudi king, Salman bin Abdulaziz Al Saud has also been accused of supporting Al Qaeda and other extremist organisations in the lawsuit filed by families of 9/11 victims. He is also known for being close to kingdom’s Wahhabi clerical establishment. Saudi Arabia has also been funding seminaries in Pakistan. The Saudi government has put the onus on the Pakistani foreign ministry, saying it funded seminaries, mosques and charities after ministry’s approval. Saudi Arabia is in a tight spot as, interestingly, Pakistani foreign office has refuted the claims, clarifying that it has no role in approval of financial assistance to seminaries and private individuals. The question is: why Saudi Arabia funded these seminaries. This question is pertinent for Pakistan had health, education and several other cash-strapped sectors that needed financial assistance badly. Instead, Saudi government chose to fund seminaries. 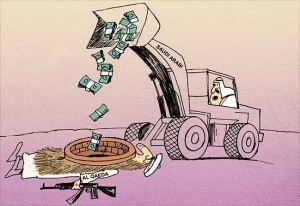 Even if the Saudi government did not provide funding to Al Qaeda, the 9/11 Commission report has not ruled out the possibility that some charities with significant Saudi government sponsorship diverted funds to Al Qaeda. Interestingly, Hillary Clinton in a leaked cable has vehemently said that donors in Saudi Arabia have been the major source of funding for terrorist groups worldwide. But there is a strange paradox – while Saudi Arabia is being accused of supporting terrorists clandestinely, the kingdom is one of the major US allies in its ‘war on terror’. In this context, Moussaoui’s statement seems to be the key to understanding this conundrum. Saudi Arabia may consider Moussaoui as a “deranged criminal”, but 46-yeard-old French citizen, who was diagnosed with delusional paranoid schizophrenia, was declared medically fit to stand trial in 2006. The former Al Qaeda operative has described Saudi government as a two-headed snake, saying House of Saud cannot survive without appeasing the extremist Wahhabi religious establishment. Saudi royals fear an Al Qaeda backlash against it for being a US ally. For this, they need protection, but as they fear dissidents among the ranks of the Saudi army, the royal family doesn’t trust its army. Instead, it is guarded by the US military and its intelligence. It is the US military-industrial complex that is involved here. Saudis acquire US weapons to buy the allegiance and security, although these weapons either gather rust in warehouses or are used by US mercenaries. US dependence on Saudi oil has also played a major role in the alliance. Then there is Iranian‘Shia threat’ to Saudi Arabia. This Saudi concern dovetails with the US interest. 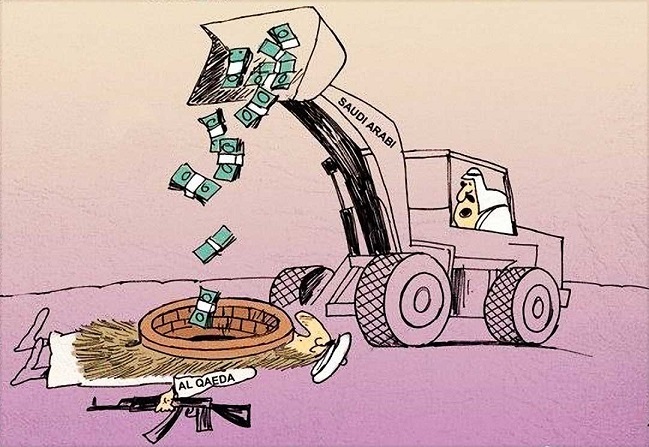 Even if Saudis are not directly involved in funding terrorists, at least money is being transferred from private Saudi organisations to extremists. Isn’t it complicity or incompetence of the Saudi intelligence that it has failed to locate and stop the source of funding to these terrorist groups? However, it is not difficult to fathom why the US doesn’t swing its truncheon to tame Saudi Arabia as it does elsewhere – Iraq, Afghanistan, Pakistan, and now in Syria. And this soft stance for Riyadh is despite the fact that 15 out of 19 Sept 11 hijackers were Saudis. The US must realise that although breaking up this unholy alliance with Saudi Arabia might hurt America’s pocketbook, it would still survive. If one takes into consideration lofty American ideals and Saudi Arabia’s despotic regime, this marriage of convenience is surely a moral blemish. Like it must end US-Israel nexus, Washington must break up the alliance with Riyadh as well. 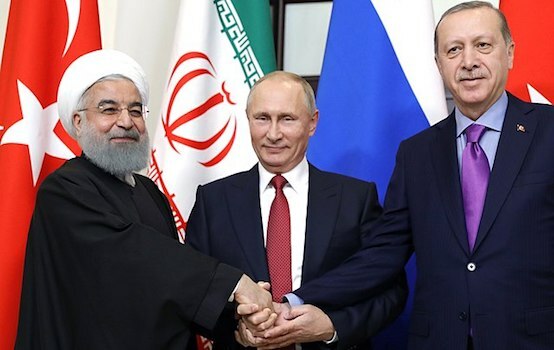 The US military interventions and support for totalitarian regimes, especially in the Muslim countries, will only result in more anti-America sentiment. It will not only make Americans a target of terrorism but will fuel international terrorism. 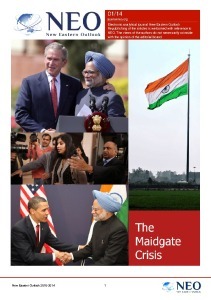 George W. Bush refused to make public those 28 pages and now President Barack Obama has reneged on his promise of revealing the secret content of the report to safeguard ‘national interests’. The US government has recently officially conceded CIA’s involvement in torturing suspected terrorists. Now it is time those redacted 28 pageswere declassified, especially when the Saudis have also called for declassifying them. On the other hand, Britain must re-open the probe into Al-Yamamah scam. Moussaoui’s allegations and voices from different quarters indicating Saudi involvement in funding terror may be dismissed as ‘conspiracy theory’ for challenging the political consensus is a conspiracy theory in the Western world. But only declassifying the 28 pages and a fair and thorough investigation into Al-Yamamah deal will not only put to rest these ‘conspiracy theories’, if they really are, but will also help to kill the fire-breathing chimera of international terrorism. Shazad Ali is a researcher and analyst who specialises in geo-political affairs, exlusively for the online magazine“New Eastern Outlook”.